Canelo Alvarez has 51 fights on his professional record, an unusually high number for a boxer who only recently turned 27 years old. Alvarez made his pro debut when he was just 15 in his native Mexico, which makes him already a veteran of 11-plus years, typically the time when fighters at least begin thinking about retirement. The two-division champion admitted on a recent conference call that despite his young age, he has thought about when he’d like to retire. If everything goes according to Alvarez’s plan, that won’t happen any time soon. 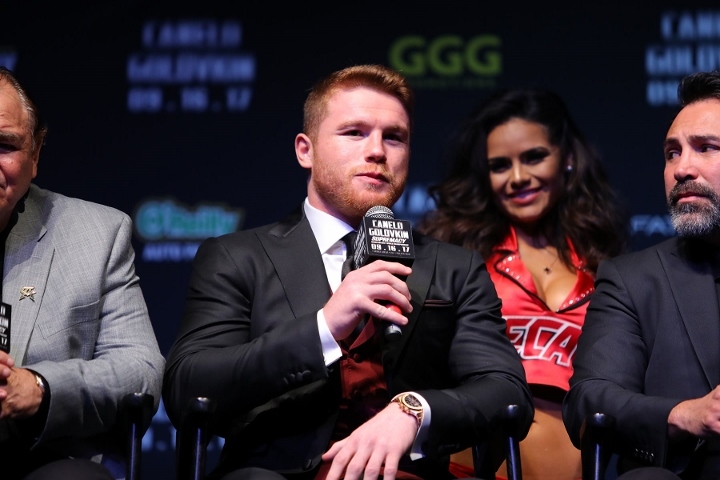 As he prepares for the second-biggest fight of his career next month, Alvarez (49-1-1, 34 KOs) thinks he’ll start seriously considering walking away from boxing when he is 34 or 35. Perhaps not coincidentally based on what Alvarez said, Gennady Golovkin, Alvarez’s opponent September 16 at T-Mobile Arena in Las Vegas, turned 35 four months ago. Boxing fans and media began speculating following Golovkin’s last fight that Golovkin has started to show signs of his age because it resulted in a close, 12-round, unanimous-decision defeat of former middleweight champion Daniel Jacobs on March 18 at Madison Square Garden. Oscar De La Hoya, Alvarez’s promoter and confidante, retired just after his 36th birthday, four months following a stunning one-sided beating at the hands of a much smaller Manny Pacquiao in December 2008. De La Hoya, a 1992 Olympic gold medalist who won world titles in six weight classes, made his pro debut when he was 19 and finished his career with 45 professional fights (39-6, 30 KOs).